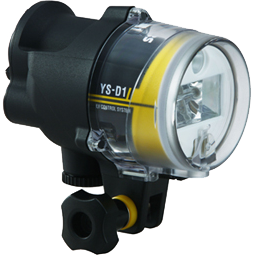 The YS-D1 sets a new standard for underwater strobes. 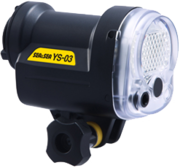 From subtle light output as low as guide number 1 to a maximum power of guide number 32, control of underwater lighting has become effortless with the YS-D1. *When the YS-D1 is used with a camera with built-in flash in housing, use the Fiber-Optic Cable. * When the YS-D1 is used with a non-SEA&SEA housing, a Strobe Mask Set may be required along with the Fiber-Optic Cable. * Use of genuine SEA&SEA Fiber-Optic Cables is recommended. SEA&SEA strobes may not function properly if a third-party Fiber-Optic Cables are used (functions such as TTL auto exposure in particular). Do not use non-recommended batteries (such as lithium primary batteries). Use of non-recommended batteries may cause battery leakage and overheating and may cause the strobe to rupture, which could result in personal injury. *Click “YouTube” to link there. Revising the algorithms used for the DS-TTL system, the YS-D1 employs a totally new slave TTL system. The strobe can adjust the interval between the pre flash and the primary flash in order to be compatible with a wide-variety of cameras, if not all, on the market today. The strobe is equipped with DS-TTL ll mode which is more responsive, more precise and more reliable. The DS-TTL ll enables a variety of strobe sync photography such as slave TTL and slave manual (11 steps) with compact or digital SLR cameras. When used with a digital SLR camera in housing, the strobe can also be connected with a conventional sync cord and through a YS Converter for TTL strobe photography. In a clear water environment, two YS-D1 strobes in DS-TTL ll mode provide perfect lighting. When you would like to emphasize contrast, setting the main strobe in DS-TTL II mode and the secondary strobe in manual mode (11 steps) offers flexibility without limiting control. When underwater visibility is poor, two YS-D1’s set to manual mode may produce the best images. 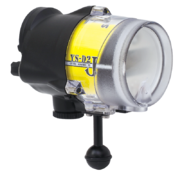 The YS-D1 is the most versatile underwater strobe available today. The DS-TTL exposure compensation function enables subtle lighting control by adjusting the Light Level dial in DS-TTL mode. Compared to the YS-110Alpha, the YS-D1 is 1EV more powerful, 50g (1.8oz) lighter and 10% smaller. Not only is the YS-D1 suitable for macro photography, but also is robust enough for wide-angle photography. it is also ideal for macro photography which requires delicate light level control. The strobe’s guide number can be reduced to 1. Highly versatile, the YS-D1 offers more automatic and manual control over lighting to get that perfect exposure. By controlling the actual flash light level, the strobe realizes accurate exposure compensation with EV value. Regardless of a compact or a SLR camera, you can achieve any desired exposure compensation. However, many TTL systems are not reliable. The YS-D1’s DS-TTL exposure compensation function allows users to adjust the light level in TTL mode (-1.5EV, -1EV, -0.7EV, -0.3EV, +0.3EV, +0.7EV, +1EV, +1.5EV). A red LED will be shown when the strobe has been charged and is ready to fire. A green LED will be shown for two seconds to confirm DS-TTLll exposure. A blue LED will be shown when the strobe is set to Slave TTL mode and the strobe has been charged and is ready to fire. In macro photography when a wide beam is not necessary, no diffuser should be attached. For an even strong circular 100x100 light output is desired, mount the Diffuser 100. When a wide-angle lens is used, the diffuser 120 should be attached. Three beam angles can be selected in accordance with the photographer’s requirements. The YS-D1 will auto-sense when a sync cord is connected, the slave ON/OFF switch will no longer be active. Simple controls and configuration enables easy operation. The light level control ratchets/clicks to aid in setting and operation. 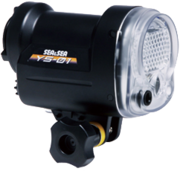 With the conventional YS adaptor, the strobe can be moved only upward and downward. However, with the Ball Mount, the strobe can be moved in a variety of angles. [Recycle time (full)] : A: 2.8 sec. Ni-MH: 1.9 sec. Strobe Adaptor and a fixing bolt to the Strobe. *1 Number of flashes and recycle time depends on the battery brand, temperature and frequency of use. *2 Number of flashes and recycle time of Ni-MH batteries were tested on 2400 mAh batteries.